We recently met with the GM of a division of a multi-billion dollar business. The larger corporate entity was running on Active Directory, but his division was run separately and they were allowed the freedom to maintain their own infrastructure. That’s good, because our GM was loathe to move to Active Directory – or integrate with the parent’s platform. Instead, the GM wanted to run his IT infrastructure in a more agile way, leveraging Google Apps. We knew just what they needed: a cloud-based directory service that could complement the division’s use of Google Apps. So we had been working closely with his team on implementing JumpCloud’s Directory-as-a-Service® platform. IT absolutely knew it was time for a core directory service to run alongside their core productivity platform (GApps). But we know we as technical IT specialists tend to be – we love to get into the details! So the IT team had a detailed list of reasons that they were interested in JumpCloud. 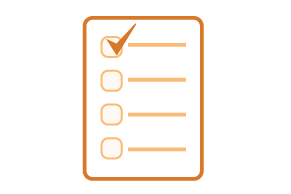 IT’s list included: centralized user management, support for Windows, Mac, and Linux devices, LDAP-as-a-Service, RADIUS-as-a-Service, multi-factor authentication, and more. But it was fascinating to hear the GM’s vision of what he wanted and needed. JumpCloud’s focus is on building a unified cloud directory. That’s our mission. And in order to achieve it, we knew we needed complete integration with Google Apps. 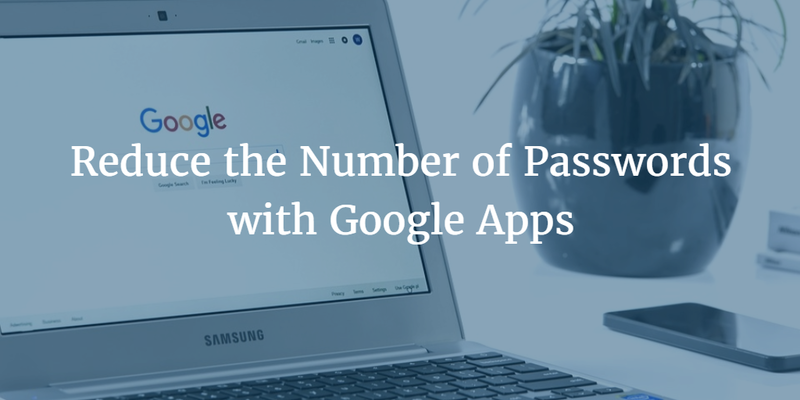 We accomplished that last year using Google’s API’s and now we’re proud to say that you can use JumpCloud to use Google Apps identities as your core user credentials, drastically reducing the number of password that a GApps office needs. For the GM of this business, we were able to completely satisfy his goal: fewer passwords, faster workflows. Of course, then there’s the IT team and their more technical-minded wish list. Again, our cloud-based directory passed with flying colors. Since leveraging JumpCloud’s Google Apps functionality, their IT team has been able to connect user identities to the IT resources they need more efficiently than before. Those resources could be Windows, Mac, or Linux systems. It could be LDAP-based applications such as OpenVPN or MySQL. Those resources could represent hundreds or thousands of cloud servers at AWS, Google Compute Engine, or elsewhere. SaaS-based applications such as Salesforce, Dropbox, Box, and others are also in the mix and so is the WiFi connection that every user needs to access. 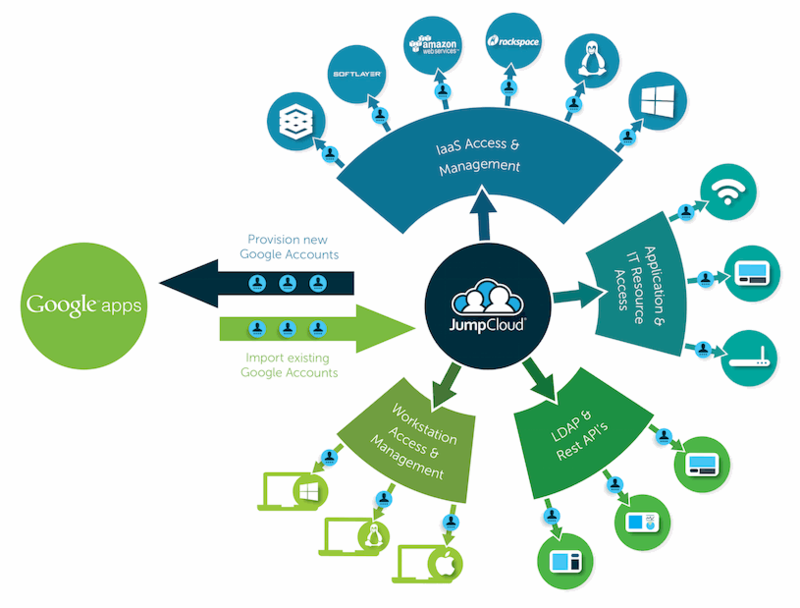 JumpCloud connects users to all of those resources with one set of credentials. For users, that’s frictionless business. For IT, that’s more time on high value problems with 2 passwords left over. If you’re wondering about security, those credentials can be further protected via 2FA. The lesson is simple: the best way to manage identities in the cloud era is with a cloud directory. 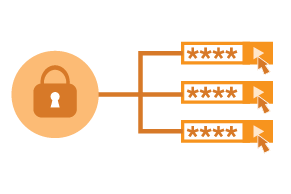 If you would like to learn more about how JumpCloud’s Directory-as-a-Service can reduce the number of passwords your users need and simultaneously increase security, drop us a note. We’d be happy to walk you through how JumpCloud is helping thousands of organizations streamline their identity management programs. Or, if you would like to try JumpCloud for yourself, sign-up for a free account now. Your first 10 users are free forever.